Hello, my name is Griffin. 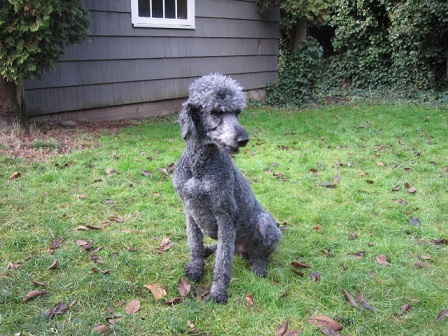 I am a wonderful, 6 year old, pure-bred Standard Poodle who is just a big noodle head! I am a joyful and happy fellow, and I love to play, romp and snuggle. I have great house manners, am house and crate trained and not a barker. I am a great greeter and will always be thrilled to see you when you come home from work! I do great with kitties and love them very much, and I do have doggy friends that I like to play with. I wasn’t always around dog friends when I was a young pup, so dog parks are a bit much for me and I would really like a home that wants to take me for walks and spend some good quality time. To schedule a meet and greet please fill out an application at pixieproject.org and send it in. I am fixed, vaccinated and microchipped. My adoption fee is $100.